‘The Walking Dead’ Season 4 Recap – Episode 1 ‘30 Days Without An Accident’!! Season 4 of the “The Walking Dead” takes place in the 7-8 months in the future. You see a community has begun within the prison. Rick has now taken in more people than just the ones from Woodbury. There is now a high council in place with Rick, Daryl, Carol, Sasha and Hershel on it. You can see how everybody has fallen into new roles within the prison community and grown as almost celebrities in the zombie apocalypse. There is a calm with the chaos of the world that they live in. In the opening scene you see how the prison looks after a length of time. There is vegetation everywhere. Rick is walking out to the fields with earphones in his ears. He looks calmer and happier than we last saw. The field inside the prison is now a farm and Rick is plowing a field. Around the outside gate, there a zombies growing at him. I noticed that the walkers are now uglier and more aggressive than previous seasons. Rick finds a gun in the field and when he pulls a headphone off, you can hear how loud the walkers are. He looks at the gun and throws the gun into a wheelbarrow. Carl comes down and joins Rick. You can immediately see the difference in Carl. He complains to Rick about not waking him up and Rick tells him that he was up all night reading comic books. They talk about their pig that looks sick and then move to a task. The scene changes to Daryl coming down for breakfast and Carol cooking behind a grill. You can see how greatly the group has grown over the past months, because the area almost looks like a mess hall with people talking and eating. Everyone tells Daryl hi and Carol tells him that she liked him first. Daryl has almost become a rock star and Patrick shows this by being so excited to shake his hand. Scene changes to a group of people killing walkers through the outside fence. All the walkers are now building up along the fence line instead of spreading out. Carol talks to Daryl about not being able to spare people for a run. Carol tells him that she is sorry about calls him “pooky”. This confirms that Carol and Daryls relationship has progressed into something more than friendship. Glen and Maggie are still together and you first see them waking up. Glen does not want her to go on the run today. The talk about how they have the suits and how everything will work out. Maggie agrees to stay behind. Tyresse goes down to where the “fence clearers” are and talks to a woman there. 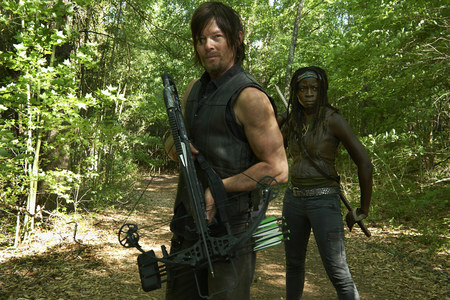 He tells his lady friend that he is going on the run today because he can no longer kill the walkers through the fence. He says its different killing them out in the field than through the fence. She kisses him and tells him to be careful out there. Daryl is getting ready for the run and Beth is talking to a boy, Zak, as he leaves. Zak and her are obviously more than friends. 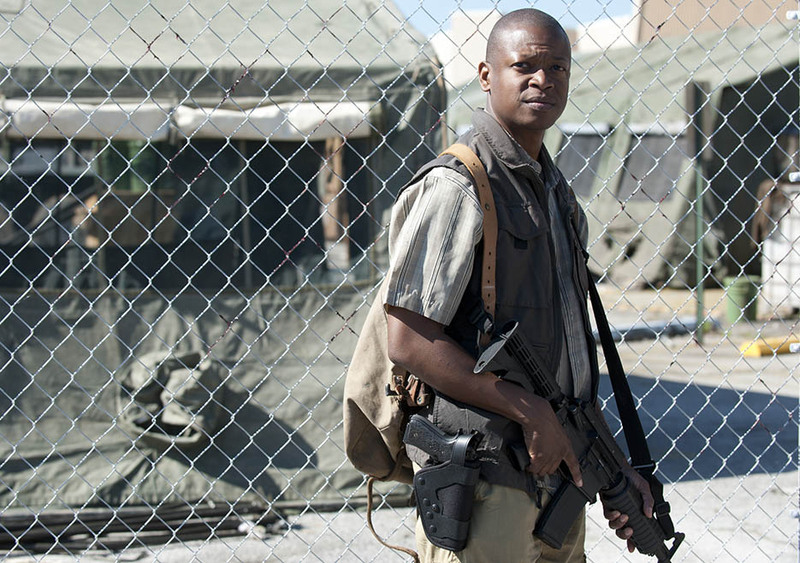 You are also introduced to Bob Stookey, a former army medic that has only been at the prison for a week and wants to earn his keep. Sasha, who also goes on the runs, is not convinced he is ready to go, but allows him to come. 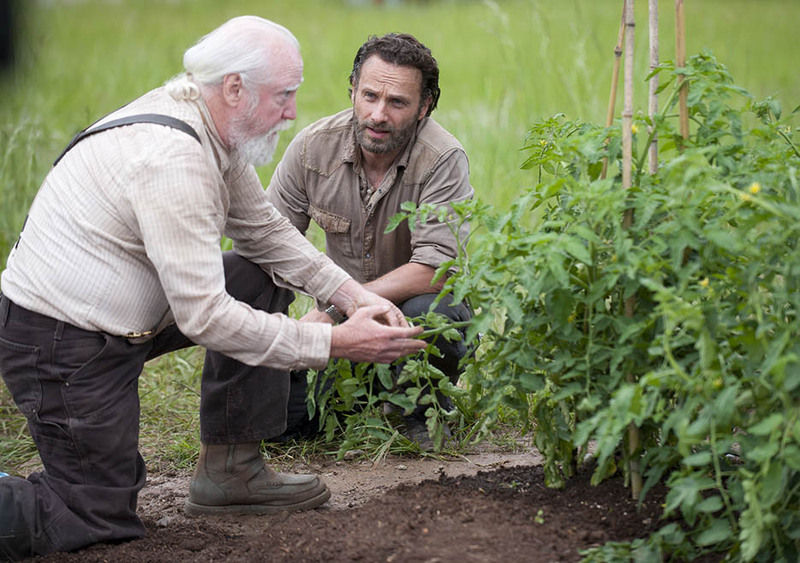 Hershel now joins Rick and they are talking about farming. Carl gets Rick attention and they run to the gate. Michonne is riding back from being gone. Michonne brings back gifts and Rick asks if she is going to stay for a little while. Daryl and the crew are pulling out and they stop to talk to Michonne. Its obvious that she has been gone for a while. She tells Daryl that she did not find him and that she wants to search somewhere farther out. Daryl asks if its worth going that far away. Daryl asks Rick if he is going on the run and Rick wants to go check the snares for food. Michonne says she will go and Carl is upset. She tells Carl that she will be back. Rick and Carl talk about how Carl is going to do chores and things that involve other kids. Hershel is still in the field and tells Rick that he needs to arm himself when he goes out on his runs. The council is worried about him going out unarmed. Rick doesn’t make a big deal about him not taking his gun, but in the next scene you see him going out and bringing his gun. Rick is checking a snare with an animal in it when he sees a figure. At first he thinks its a walker, but soon realizes that its not when she tells him to wait and asks for help. He looks stunned, but gives her his food. She asks if he has a camp and she says yes. She wants her and her husband to go back with Rick. Rick says that he wants to meet her husband and tells her that he will ask them 3 questions to see if they can go into their camp. Rick checks her out and warns her not to try anything with him. Back at the prison, some of the children in the camp are playing around the fence and naming the walkers. Carl jumps on the kids for doing that since they are now dead. Carl asks one of the girls if she has seen a person die like that, and she says yes. The kids leave and go to storytime. The group on the run end up at an fenced in old military checkpoint with a store inside. They had lured out the walkers with a boom box a few days earlier. The go into the area and make a sweep. Daryl, Michonne and Zak are sitting outside the store chit chatting when some walkers come to the window. They drag out one and the whole team goes. Sasha is obviously the one in charge of the runs and sweeps. Bob looks down and sees half a body and looks puzzled. He then goes in. The camera pans out and shows a crashed helicopter on the roof with walkers around it and the other half of the body. Rick and the lady are walking back to her camp. She is telling her story of what her and her husband, “Eddie” went through. She tells Rick how she wouldn’t have made it without her husband. Back at the store, the group is picking up supplies. Glen looks at an advertisement for baby photos and looks a little upset. Bob comes across the beer and wine section and has a moment of weakness wanting to take some wine back. You can see that he is a recovering alcoholic in this scene. After he decides to not take the bottle, he puts it back on the shelf which causes the shelf to break and all the bottles to fall. Then the entire display falls down on top of Bob, trapping his foot. The walkers on the roof hear this and move towards the noise in the middle of the roof. Daryl, Tyreese and the beau help Bob and suddenly walkers begin to fall through the ceiling. Back to Rick and the woman, they are still talking and the woman asks Rick if he thinks that they get to come back from what they do. This scene and question is important because of Ricks break down in Season 3 and coming back from that. In the store, the group fights off the walkers in one of the most gruesome scenes ever on the show. Some of the bodies land on the floor and explode on impact. Eventually the weight of the helicopter makes it start to come through over Bob. They get Bob out from under the display just in time, but lose Zak to a walker. Rick and the woman make it to her camp. Rick looks around as she talks to “Eddie” and notices that something is not quite right. She then lunges at Rick with her knife. Rick is stunned and pulls his gun on her. She tells him that she wanted to take the boar, but knew she could get Rick there quicker. She kept “Eddie” even after he turned because she could not be without him. She begs him to not kill her after she turns, and she stabs herself in the gut. Rick yells “NO!” and is in disbelief. As she lays there dying, she asks Rick what the three questions where. He asks her “ How many walkers have you killed?” She says Eddie killed them all until he turned. “How many people have you killed?” She says just me. “Why?” She says “because you don’t get to come back from things. You don’t.” She then dies and Rick closes his eyes, looks at “Eddie” under a bag and walks away. Carol is reading a book at storytime until a man walks away. She then pulls out a case and begins to give a lesson on how to use a knife. Patrick is in there and asks to be dismissed since he does not feel well. Carl has snuck in a sees Carol in the knife lesson. She asks Carl not to tell his dad and Carl runs away. It is obvious that they are not teaching the kids to fight, like Carl was taught early on. Rick is back at the prison and sees the walkers on the fence again. He sees that their pig is dead and is upset. It is now night time, and Tyrese goes into his girlfriends cell and tell her how he does not like going out there, either. Glen is with Maggie and telling her about Beths beau and how Daryl will tell her. Maggie then tells Glen that she is not pregnant and he is happy about it. She says that they can have lives here and Glen asks how can you say that after today. She says that she does not want to be afraid of being alive. Glen says that being afraid is what kept them alive and Maggie says “No, its how we kept breathing.” Beth is in her cell writing when Daryl come and tells her the news. She does not shed a tear and takes a number off her “last day of an accident” sign. Daryl is shocked at her not crying and she says that she does not cry anymore. She is just happy she got to know him. Both of them talk about being tired of losing people and saying goodbye. Beth then hugs Daryl. Michonne is in her cell looking at a map to see where to travel next. Hershel is talking to Rick about how he could not have helped the lady because she was too far gone and Rick was never that far gone. Rick tells Hershel that he was pretty close to how far gone the lady was. If he lost Carl, Judith or the prison he would be and Hershel says no, you get to come back. Bob is now laying down to go to sleep and opens his eyes to the sound of coughing. Patrick is the one who is coughing and visibly very, very sick. As he walks to the showers, you see wet footprints behind him. He goes in and turn on the water in the shower and stands underneath it. He also coughed in the water supply. After a few seconds under the water, he collapses and dies. He then comes back as a walker. This episode has set the scene for this entire season. There will be new relationships formed and a lot of new cast members coming in. On “Talking Dead”, it was discussed that this season will focus more on peoples stories and their interactions with each other. You can already see the complex hierarchy of the prison and how it could easily tumble with little ease, esp. with Patrick dying like he did. Let me know what you thought of this episode and comment below. I look forward to watching this season with the rest of you. This entry was posted on Monday, October 14th, 2013 at 6:15 pm	and is filed under Comics, News, Television. You can follow any responses to this entry through the RSS 2.0 feed. You can skip to the end and leave a response. Pinging is currently not allowed. « ‘We Are What We Are’ Interview With Jim Mickle!! !